How I got this book: I bought it from Powells in Portland! When I picked up this book, I was a bit hesitant to start reading it since I had read (and enjoyed) the first years ago. Would I enjoy the second as much as the first? Would I have forgotten too much to be able to get sucked into the world? Well, I should not have worried. Heart of Iron sucked me right back into the world and explained away all the things I had forgotten. Heart of Steel is the second book in Meljean Brooks really popular Iron Seas series. 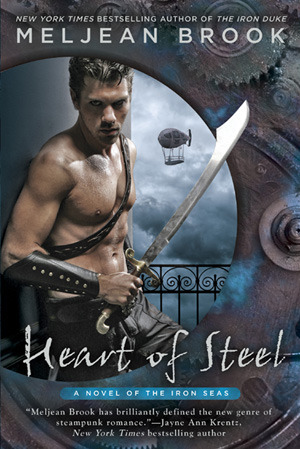 It's a steampunk romance which is utterly ridiculous to try and explain out loud. Trust me I tried. I got a lot of, "Wait you are reading a book with a half naked warrior on the cover who is trying to go reclaim lost items from a war ravaged Europe for his bounty?" "Well Europe wasn't really ravaged by war as much decimated by it. It's now infested by zombies" It is truly the best. The plot is sort of amazing all spelled out. We have our hero, Archimedes Fox, who is on the run from some hit-men trying to earn enough adventuring and artifact reclaiming to pay off the price on his head. This had taken him in the last book across the path of Yasmeen, the pirate captain of the airship Lady Corsair, and well it didn't end well. Circumstances being what they are Yasmeen is off to find Archimedes' sister to tell him of his death when things start to get weird. And then who pops back up but Archimedes, alive and well, and looking for something of his that she has. Well things lead to other things (that I don't really want to get too much into) and they end up having to work together to achieve their goals and get their lives back on track. Oh man is this book fun. I love the leads! They play off each other so well! And neither of them loses the essence of what makes them good characters once they fall in love. That is so. rare. in a romance. Neither of them are apologetic for who they are and they just sort of learn to fit together. It's just a wonderful romance and a really fun adventure story involving zombies, mechanical steampunk fun, assassins, and all that jazz. The plot clips right along and I enjoyed every minute of it! This book is only loosely tied to the first so you can start here if you feel so inclined. You will miss one scene they reference but it's not too big of a thing. Honestly though this world is so fun, I would start with Iron Duke just because you get more time there. If you are new to steampunk and want something adventurous with a little bit of steamy romance, this is a great series to read, and book two did not disappoint!